This picture shows the video capture set up in my classroom that sixth-grade students use. The computer and camera are connected. Apple's Video Player software enables students to place a sculpture on the table and take a picture of the work. The picture is then saved on the hard drive as a pict file. The above image shows the display and controls windows of the Apple Video Player. 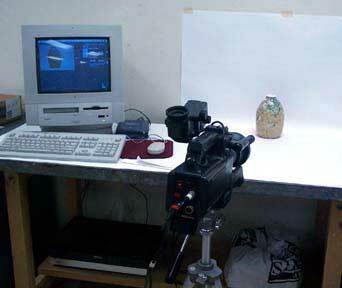 A video camera connected to a Macintosh computer equipped with a RCA video input and Apple Video Player software easily enables your students to create digital images of their three-dimensinal work. Comparable setups are available for PCs.